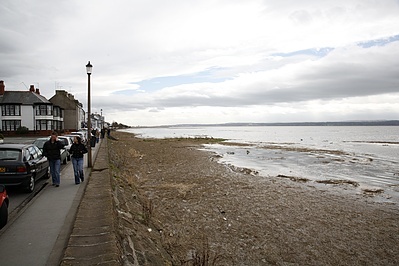 The road passing along the promenade at Parkgate is separated from the marsh of the Dee estuary by a low stone wall and a narrow pavement. The pubs and shops on the the landward side narrow the road in several places to a single carriageway, so driving along the front requires patience. There are usually plenty of people taking a walk along the pavement. For many of them, obviously visitors, this seems to count as a visit to the seaside, and they eat icecream, photograph each other, and gaze seawards. The sea can usually be made out in the distance, but there is no beach, only a marsh, criss-crossed by muddy channels and containing a few pools of water. 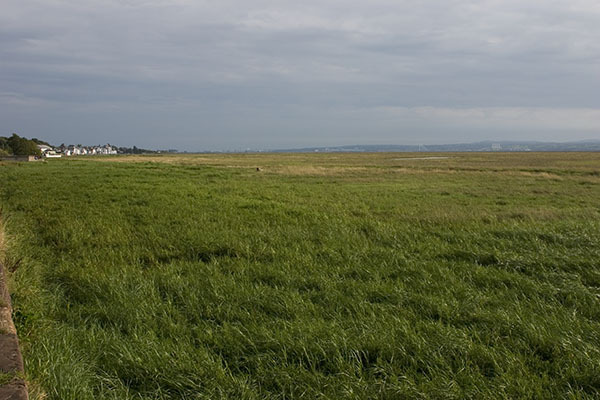 At most high tides, the sea comes nowhere near Parkgate, but on a few occasions in the year, particularly if there is a strong wind from the southwest, the tide comes in over the marsh right up to the seawall. This brings many ducks and waders closer than usual, but to the marsh residents who are do not float so easily, the high tide is a disaster. 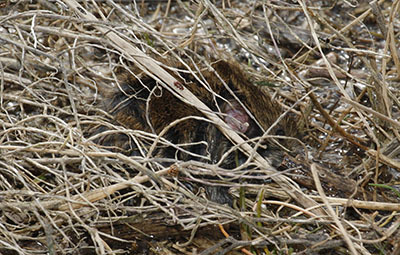 Voles, mice and shrews are driven out of their homes and have to flee the advancing waters. 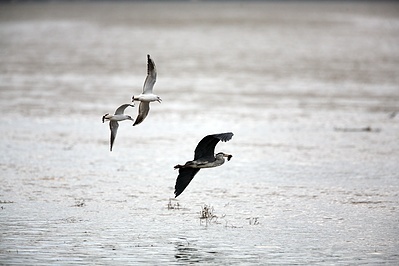 Mysteriously, predators know all about these high tides, and the resulting prey on the move. Herons, gulls, hawks and owls patrol the marsh, looking for easy pickings, and these occasions are therefore anticipated by birdwatchers, who turn up at Parkgate in droves to see the spectacle. Last Friday, I sat on the seawall at high tide, impressed by the number of insects and spiders around, driven out of the marsh, and photographing some of the action. Most of the small mammals that made it to the seawall moved so fast and found a cranny to hide in so quickly that it was difficult to get a good photograph. 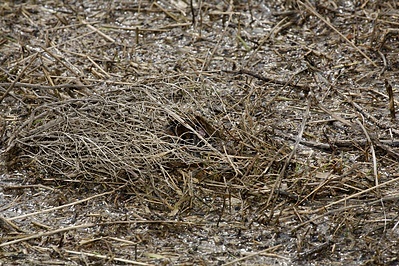 But then a mouse scampered across the surface of the water in front of me, which was covered by a floating layer of dry grass and reed stems. Two yards from me, it stopped under a dead frond protruding an inch or two above the water and stayed there, balanced upon the floating vegetation, perfectly hidden from people and predators. Passersby, wondering what I was photographing, could not see anything there. Blowing up this photo, not only can you see the mouse, but also a few of the millions of insects trying to survive the high tide. 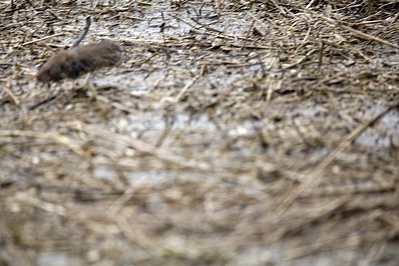 I left as the tide began to recede, leaving the mouse and the insects to return to the marsh, survivors of what must have been a terrifying experience.